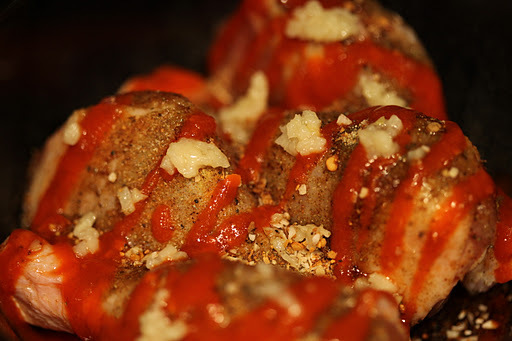 If you’ve noticed the long gap between posts, it’s because I haven’t cooked in weeks! I had guests in town and have been going out to eat a lot — essentially falling off the healthy eating wagon. Today I finally made my way to the grocery store so I’m back in business! First up, a simple dinner that may not be the absolute healthiest but is a nice treat in moderation. 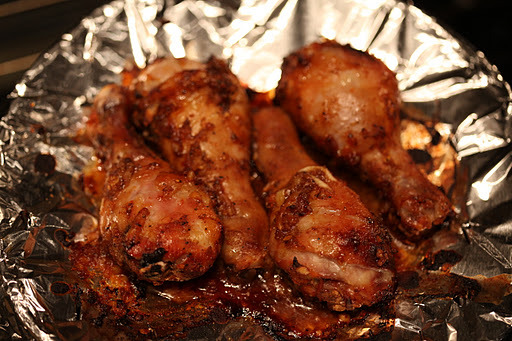 I had some chicken drumsticks in the freezer that I thawed last night and marinated today. First I started preheating the oven to 400 degrees. 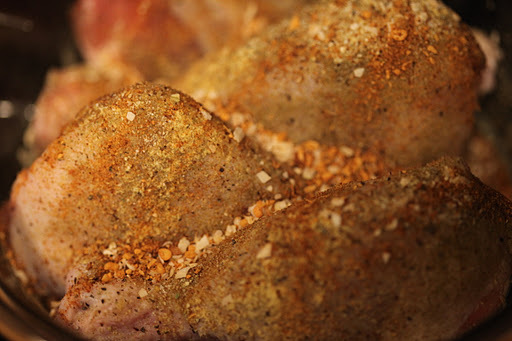 I coated the drumsticks with some spices — cumin, coriander, ginger, garlic salt, szechuan seasoning, Cavenders. I then poured a little soy sauce over the drumsticks, just enough to keep some sloshing around in the bottom of the dish. Then I drizzled some sriracha hot sauce over the drumsticks and a teaspoon of honey. Added a bit of minced garlic and some chopped onion, and it was ready to go into the oven. I normally would have just put the whole dish in the oven but decided to try a healthier variation that might help burn off some of the fat. I’m not sure this actually works, but what I did was cover a baking dish with two sheets of aluminum foil pulled taut so it would be sturdy enough to hold the drumsticks. I poked holes in the foil so the drippings could have somewhere to escape to. 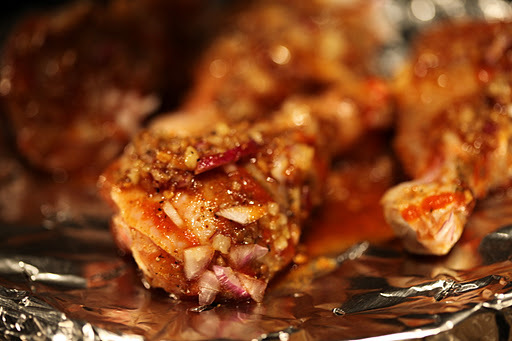 Tip: be sure to line the inside of the glass dish with foil also, or you will have a big crusty mess to clean later. 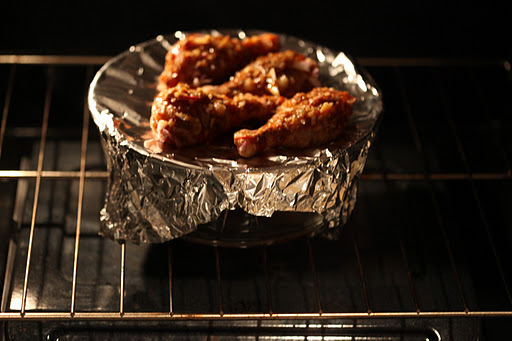 Then I placed the chicken on the foil and put the whole thing in the oven to bake for about 30 minutes until brown. In the meantime, I washed and prepped some green beans. 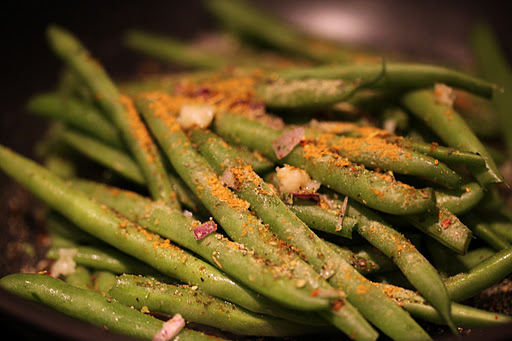 I had some remaining chopped onion and minced garlic that went into the saute pan along with the beans. I added some Cavenders, coriander, cumin, and some Thai spice mix to the beans. Just enough to add some flavor that I thought would compliment the sweet and spicy drumsticks. I added a little water in the pan and covered it so it would steam nicely. I then proceeded to forget about it and overcooked it just a bit. Not so much that the beans weren’t edible, but the heat dried out the beans and they lost the crunchiness that I prefer. I’m sure much of the nutrients were lost as well, but they still tasted good. I ended up munching on the beans while waiting for the chicken to finish cooking. It was browning nicely and I turned over the pieces after about 15-20 minutes. I added a touch more of the seasoning, sriracha, soy sauce, and honey to the new top side of the drumsticks just to give it a bit more evenness in the coating. Another 15-20 minutes, and the chicken was done. The skin was browned in some spots just enough but still soft. The meat was cooked all the way through but juicy — not dried out. It came out perfect. 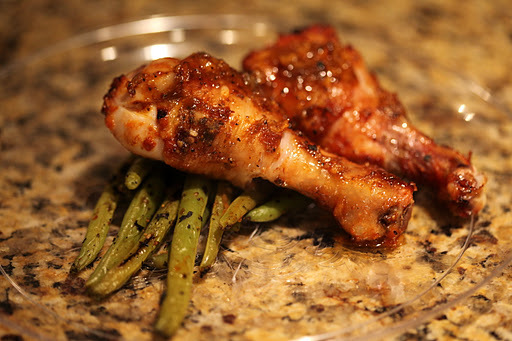 I ate two drumsticks with some green beans as my small dinner and enjoyed every bit of the sticky sweet spiciness of the sauce. I will definitely make these again soon.